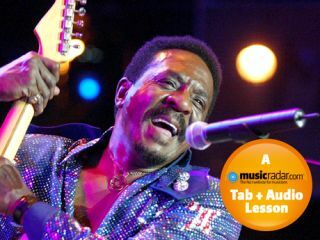 In this video lesson, we show you how to play blues guitar like rock 'n' roll pioneer Ike Turner. 5 March, 1951 - Sun Studios. The record is called Rocket 88 and the artist is Jackie Brenston and his Delta Cats, although in fact Jackie Brenston is just the singer on the track and the Delta Cats didn't really exist. The bandleader, songwriter, pianist and virtuoso guitarist Ike Turner, along with his suitably titled Kings Of Rhythm, provided the brains behind the operation, although contractual complications prevent their name from appearing on the track. For many musicologists it was this track that signalled the start to a new vibrant, exhilarating, and slightly dangerous form of music that was to take America (and, ultimately, the rest of the world) by storm: rock'n'roll. If this is not significant enough for us guitar-obsessed folk, Rocket 88 also has the added bonus of being one of the first records to feature prominently a purposefully distorted electric guitar tone, reputedly the product of a fortunate accident after the amp was dropped and one of the valves damaged. The young Ike Turner was a prodigious musical talent, equally comfortable on guitar and piano, taking lessons with the legendary blues pianist Pinetop Perkins. Turner's guitar style was raw, economic, and expressive with a cutting, aggressive but singing tone. Ike's trademark was his searing vibrato, achieved not with the fingers but with the vibrato bar. Ike's troubled personal life, with long spells in prison for drugs and weapons offences and well-documented accusations of spousal abuse, was to overshadow his musical achievements and his career suffered severely as a result. In recent years Ike reformed his Kings Of Rhythm and returned to his blues roots, releasing the critically acclaimed Here And Now in 2001, and the Grammy award winning Risin' With The Blues in 2007. It seemed that Ike had turned a corner, but unfortunately his personal demons had not left him, and on 12 December 2007 he was found dead at his home in San Diego following a cocaine overdose. [Bars 0-4] Let's kick of our solo in typical rock'n'roll fashion with some simple pentatonic phrasing (E G A B D) mixed up with some bouncing rhythmic doublestops. Our first example of the trademark Turner vibrato-wobble comes in bar 4. [Bars 5-8] More E-form minor pentatonics. The tremolo picking in bar 8 doesn't need to be too accurate. Ike's playing style was quirky and erratic. We're after jagged and aggressive here so don't be afraid to dig in hard. [Bars 9-12] When dealing with relatively simple melodic material the rhythmic element to music takes on paramount importance, a concept that is perfectly illustrated within these measures. Some small but beautifully formed chord voicings bring our first solo chorus to a close. 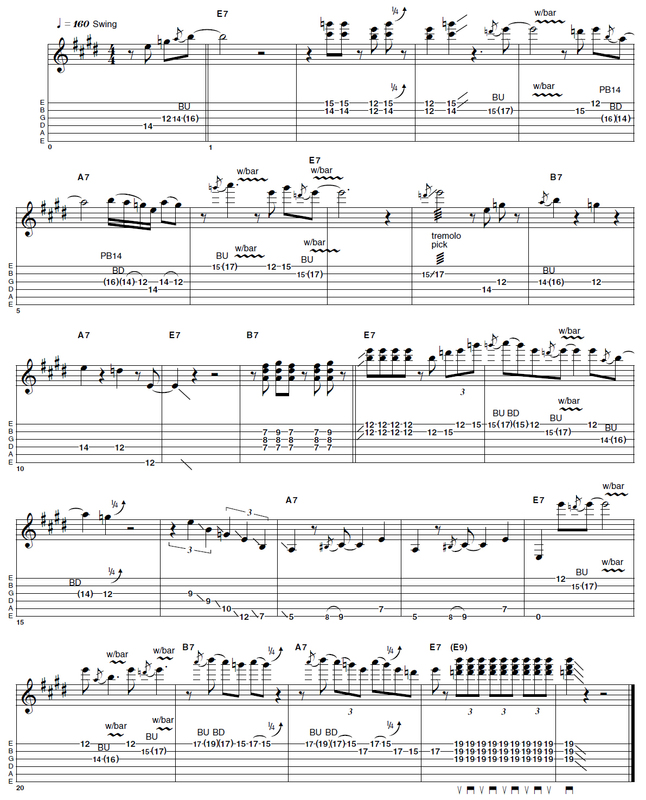 [Bars 13-16] Repetitious double-stops are a fantastic way to up the intensity levels within a blues solo, and Ike certainly knew how to use them to great effect. The 'falling down' triplet figure in bar 16 is again a fair bit more precise than Turner's raw primal version. When Ike executed ideas such as this the notes were often almost random, with the pitch taking on a secondary role in relation to the rhythm. [Bars 17-18] Where would rock'n'roll be without a few well-placed riffs? Well, we're certainly well catered for here, spelling out our A7 (IV) chord with a melodically appropriate A major triad (A C# E), accessorised perfectly with minor 3rd approach note (C), just the fashion!